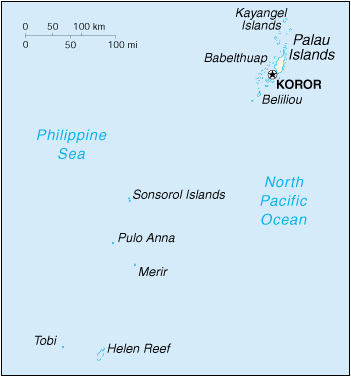 The Republic of Palau is an archipelago located in Oceania, near the Philippines and Indonesia. It is distinct for having one of the highest qualities of life in the region of Micronesia. 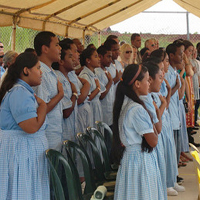 Although Palau has successfully improved the quality of its education and health care services, as well as the administrative side of its justice system for minors, there is still work to be done to ensure the well-being of children. 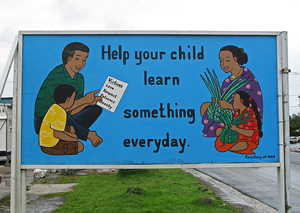 The right to an education is written into the Palauan constitution. Since the education system is inspired by the American system, the curriculum is as follows: “pre-elementary” (preschool, kindergarten, then 1st – 8th grade), then high school (9th – 12th grade), then finally post-secondary school. School is mandatory for children between the ages of 6 and 17. Because of this, 88% of students attend “pre-elementary” school, and 98% attend high school. The rise in quality of life in Palau has allowed the country to provide substantial health care services, increase life expectancy, and lower the mortality rate to 12.1%. Although this mortality rate has fallen, it is still higher than industrialized countries. All children have access to basic health care. Obesity is a problem for 24% of children. Poor eating habits, no dietary awareness, as well as a lack of sports are the main causes of this disease. Barely 10% of children eat fruits and vegetables. Despite all the educative efforts launched and the enforcing of protective laws for children, adolescents must deal with cigarette addiction as well as alcoholism. There is a dependence on drugs: 35% of them use marijuana regularly, and almost 70% of Palauan children usually chew a drug called betel nut. In fact, ingesting this highly carcinogenic drug has become a cultural practice since the 1970s, and its users have formed a community. It is difficult to grasp all the problems that cause these dependencies, but some causes of these addictions may be a lack of communication within families, as well as parental absence for vulnerable minors. Disabled children represent less than 7% of all children in the archipelago. From birth to age 21, these children have access to health care, education, and social services, like other children. However, once they reach 21 years old, there are not many systems to assist them to adapt or create a bridge for transitioning into adult life. 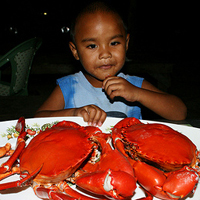 Abuse or negligence affects 1% of children in Palau. There are no social systems to aid abused children. Normally, such children are sent to their maternal uncle, because in the tradition of the country, he is the one to protect the child when the latter is in danger. Foreign children adopted by Palau citizens do not have access to the same rights as children born of Palau citizens. The main difficulties will show up once they become adults; in particular, foreigners cannot gain Palau citizenship, own property, or be left an inheritance. Only 50% of children in Palau live with both parents; 39% live with one. Other family members often raise children. This leads to problems with academic discipline, and sometimes delinquencies. In that case, every effort is made to settle the child’s disputes with the law outside of the courts. Most cases are handled between the family, friends, and police officers. For less serious, non-criminal transgressions the Ministry of Justice lays out a three-step alternative: pardon, restitution, and community service. The child who committed the infraction and the victim are often given an opportunity to meet. If both parties agree, the child accepts his or her responsibility, and the victim explains the consequences of the child’s actions. Then, they decide on the method of reparation, either restitution (if necessary) or community service.